PETALING JAYA: Eastern & Oriental Bhd (E&O) net profit for the first quarter ended June 30 rose 103% to RM10.2mil from RM5.1mil in the same period last year, driven mainly by its property development arm. However, its revenue for the quarter was 37% lower at RM46.3mil compared with RM73.9mil a year ago. In a statement, executive director Eric Chan Kok Leong said the results were largely attributable to profit recognition of its St Mary Residences project in Kuala Lumpur and Villas-by-the-Sea at Seri Tanjung Pinang. He said an upcoming highlight for E&O would be the launch in November of Straits Quay, which would be Penang’s first seafront retail marina. This 12-acre retail centre and commercial enclave will be built around a marina at E&O’s masterplanned seafront development of Seri Tanjung Pinang. Malaysia’s iconic pewter brand Royal Selangor has yesterday announced its plan to set up a Royal Selangor Visitor Centre at the Straits Quay retail marina in December. “E&O has successfully built its brand locally in the past five years to be on par with even some international names,” Chan said. The proposed project is part of the Kuala Lumpur development master plan. UDA took over the site in November 1996 when the prison was officially closed. The development was first unveiled by Second Finance Minister Datuk Ahmad Husni Hanadzlah in May. KUALA LUMPUR: UDA Holdings Bhd is talking to a few joint-venture partners to develop the former Pudu jail site and the 22-acre land next to it, but UDA will remain the sole master developer. The project is estimated to cost about RM5bil. UDA chairman Datuk Nur Jazlan Mohamed said: “We will try to keep it at RM5bil. “This is a project for the country. If we target the product well, we will be able to have a good price for the residential portion of it, even if a large portion of it will be bumiputra-owned. The Pudu Prison site will be our social responsibility. “We must have a mix in terms of bumiputra and non-bumiputra ownership to do justice to the land value. There must be a mix. (I) don’t put a figure to it but there must be a mix. He said there had been a lot of speculation on who the JV partners were. There was also a lot of speculation that there would be a joint master developer, he added. “There will be no joint master developer. We will be the sole master developer but we are talking to a few developers to be our joint-venture partners. “So far, many developers have shown their interest but there is no decision yet,” Nur Jazlan said. He said the joint ventures could be at the plot level, where JV partners take up one of the six plots, or it could be a joint venture to construct the buildings on the different plots. He said it really depended on the final layout of the master plan and that he was tweaking that at the moment. Nur Jazlan said he was making adjustment to the latest round of plans because he was taking into consideration Permodalan Nasional Bhd’s proposed plan to build a 100-storey project at the Stadium Merdeka site, which is not far from UDA’s site, as well as the 34.4ha development at Dataran Perdana, to be known as Kuala Lumpur International Financial District in Jalan Sultan Ismail near Berjaya Times Square. New plans will be submitted by the end of the year by UDA, a government developer. “The property that is being developed around us will define our final plan,” he said. While Nur Jazlan agrees that it should be a mixed development comprising serviced offices, residential, retail and a hotel or two, he has his own views about the form, positioning and configuration of the various components. “We will submit new plans by the end of the year. The final project depends on market conditions as well as other properties that are being developed around us,” he said. “Depending on the buildings and their density, the price premium that UDA has to pay the Government will vary. I want to stress the fact that the land is not given to us. Because it has a commercial title, the price of the premium will be higher. “The first and most important question we are asking ourselves is: Do we want to rely on spillover traffic, that is, take the easy way out and just develop the place, or do we want to create a new destination? KLCC, for example, is a new destination,” he said. The proposed project is part of the Kuala Lumpur development master plan. UDA (then known as the Urban Development Authority) took over the site in November 1996 when the prison was officially closed. 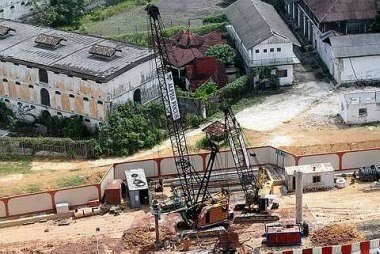 The development of the former Pudu Prison was first unveiled by Second Finance Minister Datuk Ahmad Husni Hanadzlah in May. Husni said then that the mixed development project, to be known as Bukit Bintang Commercial Centre, will comprise a 33-storey office tower, a shopping complex, 43-storey hotel and a 44-storey serviced apartment. The proposed development drew various comments from developers and property consultants. They ranged from the challenges of marketing a site where executions have taken place to the number of projects being spearheaded by the Government. Questions have also been asked about who will occupy these various premises, which so far number about five, that the Government and government-linked companies are going to be involved in. These include the development of Sg Buloh, the Matrade development by the Naza group, the redevelopment of Kampung Baru, the Stadium Negara project, 1MDB’s works in Sg Besi and Dataran Perdana. Some of UDA’s projects include condominiums Sinaran TTDI in Taman Tun Dr Ismail and Gaya Bangsar in Bangsar, both in Kuala Lumpur. UDA is also tasked with the RM52mil upgrading works of Puduraya bus terminal in Kuala Lumpur. The Puduraya terminal would resume operations in January next year. Nur Jazlan said while Puduraya would remain the main terminal, as the city grew it was better to have mini transport hubs in various places like Gombak, Bandar Utama, Titiwangsa Selatan and other places. AXIS REIT Managers Bhd (ARMB) plans to buy a cluster of commercial assets worth more than RM200 million in Petaling Jaya and Shah Alam to expand its portfolio. Chief executive officer Stewart LaBrooy said it will place out about 20 per cent of its current fund size to raise up to RM160 million for the acquisitions. "If we leverage that up, we can buy over RM200 million new assets," he told Business Times yesterday after its shareholders meeting in Kuala Lumpur. ARMB, the manager of the world's first office/industrial Islamic real estate investment trust (REIT), now manages 27 properties with more than 4.5 million sq ft of space worth RM1.2 billion. The properties range from offices and warehouses to logistic centres and hypermarkets. 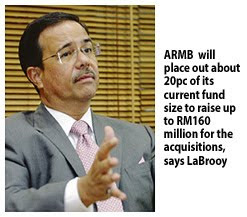 LaBrooy had said in July that ARMB is targeting to manage RM1.6 billion worth of assets. Its latest deal is to buy Tesco hypermarket in Johor, Axis Technology Centre in Petaling Jaya and Axis PDI Centre in Klang worth RM200 million. ARMB is also buying a logistics warehouse in Port of Tanjung Pelepas in Johor, Axis Techpoint 1 in Petaling Jaya and an office building in Cyberjaya. The acquisitions worth a combined RM190 million will be completed by early next year. LaBrooy said ARMB plans to refurbish three of its existing properties over the next two years for RM2 million to RM5 million each to raise rentals. The properties are Kayangan Depot in Shah Alam, Crystal Plaza and Infinite Centre in Petaling Jaya. On REIT, LaBrooy said the market was doing better, compared with 12 months ago, attributed by the strengthening of the ringgit and the equity market. "It has come back on the radar. We are far more liquid now. The market has outperformed the industry. Government-linked companies are performing well and that augurs well for the country and with that comes a lot of opportunities," he said. KUALA LUMPUR: Mah Sing Group Bhd posted net profit of RM29.16 million in the second quarter ended June 30, 2010, up 26.5% fromRM23.04 million a year ago. It said on Thursday, Aug 26 that revenue jumped 72.8% to RM289.05 million from RM157.23 million. Earnings per share were 3.55 sen versus 3.67 sen.
“We have exceeded our full year sales target of RM1 billion within seven months and have revised our sales target to RM1.5 billion for 2010,” it said. For the first half ended June 30, it said revenue rose 66% to RM527.36 million and net profit 25% to RM57.04 million. Projects that contribute to solid revenue and profit for the current financial period include Southgate Commercial Centre, StarParc Point , i-Parc@Bukit Jelutong , Perdana Residence 2 , Aman Perdana, Hijauan Residence and Kemuning Residence in Klang Valley; Residence@Southbay in Penang and Sierra Perdana , Sri Pulai Perdana 2 , and Austin Perdana in Johor Bahru. The plastics division also recorded improved revenue and profit over the corresponding period in the previous year. “The remarkable property sales recorded in the first half continue to provide steady cash flows and liquidity. The group’s balance sheets remain healthy with low net gearing ratio at 0.05 as at June 30, 2010,” it said. WASHINGTON: US home sales are plunging despite rock-bottom mortgage rates as high unemployment prevents people from buying houses and threatens to curtail economy recovery. Existing-home sales plunged for the third straight month by a whopping 27.2 per cent in July to levels unseen in more than a decade, an industry group said on Tuesday. Sales of single-family homes, townhomes and condominiums dropped to 3.83 million units from 5.26 million units in June, said the National Association of Realtors. The slide was more than double the 12.1 per cent expected by most economists, with sales at the lowest level since 1999. "The disappointing US home sales data has investors worried that the global recovery is unraveling," said Chris Lafakis, an economist at Moody's Economy.com. Single-family home sales - accounting for the bulk of transactions - were at the lowest in 15 years, the association said, providing the latest statistics on the housing sector, which was at the epicentre of the financial crisis that plunged the nation into recession in December 2007. If sales do not improve, rising inventories - there are nearly four million unsold previously owned homes in the market - could eat further into prices. "The first worry is that we are not seeing much response in demand to the historic drop in mortgage rates," said Societe Generale analyst Aneta Markowska. Thirty-year mortgage rates have fallen to a record low 4.42 per cent but mortgage applications for new purchases as of early August were sitting very close to cyclical lows. "Housing and employment continue to be major problems for the US recovery," said analyst Andrew Busch of BMO Capital Markets. WASHINGTON: Sales of previously owned US homes took a record plunge in July to their slowest pace in 15 years, underlining the housing market’s struggle to find its footing without government aid. Tuesday’s report from the National Association of Realtors (NAR), which was much worse than market expectations, was the latest data that indicated economic activity continued to slacken into the third quarter. The NAR said overall sales were at their lowest since it started the existing-home sales data series in 1999, with single-family home sales that account for most business at their lowest since 1995. Association chief economist Lawrence Yun characterised the overall sales as the softest since 1995. The dismal sales report came as Chicago Federal Reserve president Charles Evans warned that the risk of a double-dip recession was higher than six months ago. He doubted that output will actually shrink but said recovery will be modest. Existing-home sales dropped a record 27.2% from June to an annual rate of 3.83 million units. June sales were revised down to a 5.26-million-unit pace from a previously reported 5.37 million. Financial markets had expected sales to fall only 12% to a 4.70-million-unit rate last month. The end of a popular home-buyer tax credit, which had supported sales and home-building activity, continues to haunt the troubled housing market. Major US stock indices tumbled more than 1.3% as investors dumped riskier assets in favour of safe haven government debt. Prices for US Treasuries rallied, with the yield on the two-year note tumbling to a record low. The cost of insuring US homebuilders’ debt rose. The US dollar fell to a 15-year low against the yen and also dropped versus the euro. The housing market, which helped to push the economy into its worst recession since the Great Depression, has been mired in weakness following the end of the tax credit in April. The incentive pulled forward sales and building activity, leaving a huge void that analysts said was also being exacerbated by a 9.5% unemployment rate. The sour economy, especially the stubbornly high unemployment rate, is hurting President Barack Obama’s popularity and putting in jeopardy the Democratic Party’s control of Congress in November’s mid-term elections. Almost three-quarters of Americans are very concerned about unemployment and more people now disapprove of Obama than approve of him, according to the latest Reuters/Ipsos poll. The government is expected to revise down tomorrow growth in second-quarter gross domestic product to an annual pace of 1.4% from 2.4%, according to a Reuters survey. Dallas Federal Reserve Bank president Richard Fisher told Fox Business Network that the US central bank decided to reinvest proceeds from its mortgage-related assets to avoid unintentionally clamping down on monetary policy when the recovery was showing signs of weakening. The Fed, which has kept overnight interest rates near zero, has repeatedly said it stood ready to take further steps should the economic picture deteriorate. It announced this month that it would use proceeds from mortgage-related assets to buy longer term Treasury debt. Some analysts said the drop in existing-home sales had been exaggerated by the end of the housing tax credit. “We are seeing a bit of an over-correction from the end of the tax credit; we will probably see another month or two of this before we start the upward trend,” said Eric Fox, vice-president for statistical and economic modelling at Veros in Santa Ana, California. With home sales tumbling, the inventory of previously owned homes for sale rose 2.5% to 3.98 million units from June, representing a supply of 12.5 months – the highest since at least 1999 and up from June’s 8.9 months. The jump in the supply of homes was almost double the six to seven months’ supply, given that has been historically consistent with stable prices. Last month’s foreclosed properties accounted for 22% of sales while short-sales made up 10%. First-time buyers accounted for 38% of transactions, the lowest in 12 months. The national median home price rose 0.7% from July last year to US$182,600.